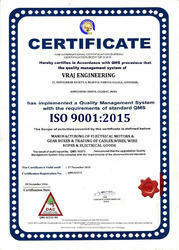 Vraj Engineering is an ISO 9001:2015 certified enterprise manufacturing a wide range of electrical motors. 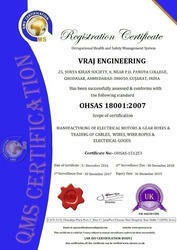 Vraj Engineering is an OHSAS 18001:2007 (Occupational Health and Safety Management Systems) certification by QMS Certification Pvt. Ltd.
Unmatched Experience – Our team have combined experience of two decade which makes us different from other electrical product manufacturers. We have a proven record of accomplishment and are a reputable company in India. One Stop Solution for Industrial Electrical products - We provide total manufacturing services all under one roof, saving you time and money. Our Work Ethics - We are dedicated to providing quality assured products and services to both the commercial and industrial sectors. For us, honesty is the only policy and we strive to complete all projects with integrity with our clients. Expert Support Team - Our staff offer assistance to customers on product selection, application and operation relevant to their needs. Our after sales support is excellent and revert your query promptly. 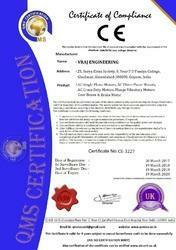 Vraj Engineering is a CE certified under licence no: CE-3227 certification by QMS Certification Pvt. Ltd. The biggest assets of the Vraj Engineering are our experienced and qualified employees. With this experience we can bring you the best products at the best prices, combined with the best service. We work hard, long hours to ensure every customer gets attended to and is satisfied with doing business with us. We are proud to say that our customers can rely on us to consistently deliver the products they need, when they need them most. Vraj Engineering is a authorised distributor of M/s. 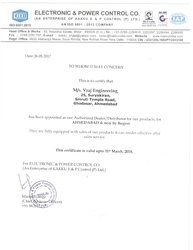 Electronic and Power Control Co., Bhilai for Ahmedabad & near region.